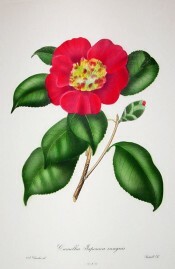 A cultivar of Camellia japonica L., ‘Insignis’ has flowers that are at first bell-shaped but unfold the large outer petals to exhibit a dense, globular mass of small, variegated petals. The large outer petals are of deep rose with darker veins, the inner rose, variegated with white. [ICR]. It was bred by Chandler about 1820. [ICR]. Chandler pl.31/1831. Listed in the 1850 and 1857 catalogues [T.235/1850]. Desideratum to Loddiges’ Nursery, 6th January 1845 [MP A2933-2, p.28]. This is the probable source. ‘Insignis’ is listed in both the 1830 and 1836 editions of Loddiges’ Nursery catalogue, copies of which are held at Camden Park [CPA]. In the 1830 edition it is marked with an ‘o’, denoting newly introduced to the Colony. There is also a dash next to it, the meaning of which is not clear. In the 1836 edition it is marked with an ‘x’, which denotes common before or long introduced.